We think we’re human, but only 1 out of 10 cells in our body even has human DNA. Tweet This! We’ve moved on from cyberpunks hacking computer code to Bio-Punks hacking into biological codes. Tweet This! If Time Magazine is to be believed, 2040 is the year immortality will become a reality. Tweet This! 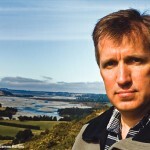 It’s my pleasure to welcome James Rollins to the show; he is a veterinarian-turned best-selling action adventure thriller author of the SIGMA Force series, and author of the new book, The 6th Extinction. James, welcome, how are you? Good good. Tell us a little bit about the book, if you would, and let’s learn more. Sure. This is the 10th book in my SIGMA Force series, not that you have to read them in any particular order. I don’t think many people have read my books in the order I wrote them – just hop in when you can. This novel starts out with a frantic distress signal sent from a remote military research station on the shores of Mono Lake in Northern California with the words “Kill us, kill us all”. The marines rush in and they find that the scientists at this lab are all dead – and not just the scientists. Every living thing within 50 square miles is annihilated: animals, plants, bacteria, all sterilized, and the plight is spreading. To stop it, SIGMA must face its greatest challenge to date, which is the coming extinction of mankind. So how does this occur? Well, the consensus among scientists today is that we’re at the brink of the next great mass extinction event – one to rival the asteroid that wiped out the dinosaurs, which was extinction event no.5, but there were 4 more even prior to that. At this point we’re losing species at the rate of about 3 every hour, which totals to about 30,000 species per year. As a writer, I’ve always got my antennae up for that next big idea, and I’m always looking for a scientific concept that has some bearing on today and then seeing where that science leads us to and what’s over the horizon. That becomes the breadth of this novel – something goes awry in one of these labs that are seeking a way to stop this mass extinction event. So, they’re trying to stop the extinction, but the unintended consequence is that they actually cause it? Yeah, so basically the last five extinctions were caused by natural causes – massive volcanic eruptions, asteroid strikes etc. But this time we are the asteroid, we’re the ones causing this damage through pollution, urbanization, the global spread of invasive species. It’s human kind that’s causing the extinction rate to rise to about 1000 times the normal background rate of extinction. Since we sort of caused this mess, maybe it’s our problem to get out of it. While I was writing it, it was hard to keep abreast of it. The information is coming in so quickly I actually had to keep changing parts of my story to match the science that was occurring. Just two weeks ago, the Scientific American had an article published which stated they believed we have one or two generations to turn this tide and this impending extinction away, before we go over this proverbial cliff. No question about it. Forgive me, but could you narrow it to say that we cause the extinction? Certainly there are lots of issues and problems like that, I agree, but as they’re trying to stop the extinction, how do they cause it? I was thinking you were going to say something like ‘It’s climate change’ or ‘It’s pollution’ or something more general. What does the extinction of all these species mean to us? 30,000 a year is an alarming rate, but how many are there to start with? I don’t even know. There are billions of species, right down to tiny bacteria and viruses. I did a book about our human body – we think we’re human, but only 1 out of 10 cells in our body actually has human DNA in it. The other 90% of cells in our body are foreign, in the form of bacteria, viruses and things that don’t carry human DNA. That’s how intimately we are combined into this planet. 90% of our cells are not us. They’ve intimately involved due to the environment itself. As we’re changing and polluting this larger biosphere called the earth, theoretically because we are 90% not us, we are putting ourselves at great risk even just from that standpoint. So, you’re just talking about all the bacteria and so forth in our bodies? Right, and all the viruses. There are also mites and lice. We are basically our own little biosphere in and of ourselves. Fantastic. It’s really quite amazing, certainly if you ponder that idea. So they’re trying to stop the extinction.. what do they do that causes it when they’re trying to stop it? At this point, there’s an accident that occurred in one of the labs. There are a few camps when it comes to dealing with the environmental situation that we’re in. There’s the conservationists – those that are trying to preserve old species, and then there’s a whole new group, which is where a lot of the young scientists are, and this is in synthetic biology. These are the people that are playing with genetic toolboxes and reading and writing DNA, trying to splice in extra hardiness into species, or even at this point, creating species from scratch. There’s a lab that produced designer yeast from just chemicals in a bottle – from which they were able to produce living, replicating yeast bacteria. I have a background in veterinary medicine and evolutionary biology myself, and I thought I was fairly abreast of what’s going on. I was startled at how far advanced some of this has gone. It’s even spreading outside of these big labs, these government- or corporate-sponsored labs, or even University-run labs that we’re now seeing exploration in, and where they’re fiddling with this genetic toolbox. In garages, attic spaces, community centres, there’s a whole movement called the Bio-Punk movement, where people are producing their own life forms and patenting them. The cost of doing this genetic research and manipulation has got so cheap and so quickly. Similar to this, the rate at which computers are able to process in the same way that we have a genetic ability to process things. Right now, we can write DNA about 10 times faster every year, so 10 years down the line, we’re looking at people able to read and write DNA at the point of millions of times faster than we can today. That’s amazing what you’re saying. So, the first thing is about the Bio-Punk Movement. How do you create a life-form? I thought, even if you can do it, it would take some giant lab? But people are doing this in the garage? It’s a startling thing. It’s part of this whole plug-and-play system of genetic manipulation now, where you can actually buy these products called BioBricks, and they’re almost like little Lego pieces of genetic material. In just a matter of a few hours, novices can be trained to accomplish these goals and learn how to do this. You can add different BioBlocks onto different bacterial genomes and produce replicating plaques of bacteria. I’ll give you one example. The kick-starter program – for $40, this BioPunk group will send you a set of weeds that have a glowing gene incorporated into them, so that your weeds will glow in the dark. This science is already done, and you can buy it for $40. Right now, they have 5000 backers, so that basically when they reach their maturation point with this program, they’re theoretically going to have about 500,000 of these glow in the dark weed seeds, and they’re recommending that people spread these far and wide. This is a little disconcerting, because nature has a tendency to take things that we put out there and steal it, manipulate it and mutate it. I talked to a gentleman with the FBI’s Biological Counter-measures Unit to find out what’s going on in some of these labs, both in garages and in the big labs. I wanted to know what sort of oversight there is – what if something goes wrong in one of these facilities? What’s the recourse? He said ‘Well, at this point we have 15,000 scientists that operate in these Bio Level 4 labs – the labs that deal with the deadliest of deadly – and we have no people at all that actually look over their shoulders. What we depend upon is self-policing; we depend upon the notion that if something goes wrong, hopefully someone will tell us. It’s a little disturbing. It’s a little disturbing that that’s the level of bio-containment for things that are rapidly changing and rapidly breaking out of mainstream labs and into some of these shadowy types of places. Yeah, if someone creates the next Frankenstein, and it’s self-policing, hopefully they’ll let the authorities know. And just a couple of days ago, US Today had an article stating that there have been 1100 accidents in these labs in the last couple of years. In the chilling words of the gentleman I was speaking to, basically it’s not a matter of if something bad will happen, it’s just when. If it’s not bio-terrorism or someone sneaking a student into one of these labs’ programs that’s going to steal or learn some technique that they’ll take home and which will be a problem later down the line, it’s simply lab accidents. That alone can wreak quite a bit of havoc, which is where this novel begins – it’s an accident that occurs at the lab. We find out later down the line that it is linked with bio-terrorism. Oh yeah. Amazing. While you were talking, I looked up on www.amazon.com ‘BioBricks’ and didn’t get a match. On KickStarter, I can’t seem to find that project by typing in ‘BioPunk’ or ‘glowing weeds’ or anything, but that’s fascinating. Do you have a suggested keyword? I think our listeners would like to look this up themselves. Yeah, if you just put in your Google search ‘BioBricks’, all one word. They have 20,000 BioBricks right now that you can order and there’s a whole IGEM program with High School students, which should give you an idea of how easy this is. There’s an IGEM competition, which is International Genetically Engineered Machine, whereby High School students are competing as to who can create the most unusual life-form using the BioBrick programs. There was a group of Slovenian students that produced a bacteria that generates a drug that can treat ulcers. This was done by High School students. Oh yeah, I love the idea of the democratization of science and tapping into the brain power. One of the greatest traits of this country is that we do think outside the box. I wouldn’t mind a little bit more oversight, though. [Laughs]. Just a few more checks and balances would be good. Right. So what would happen, potentially? Someone would create something in their garage, they would spread it around in nature – what would they do? Plant it? Would they just release this bacteria out of a Petri dish? I know you have to go soon, but just give us the mechanics of that really quickly. That was the third element mentioned by the gentleman I was speaking to from the FBI, that he was concerned about: the purposeful release of organisms by this KickStarter program. You can probably search ‘KickStarted Glowing Weed’ and some results should show up at some point. At the back of my book, I have a ‘What’s true, what’s not’ section that also can lead you to information about BioBricks and the Bio-Punk Movement. Wow, fascinating. The Bio-Punks – I had not heard of that. It’s basically the millennial equivalent of the cyber punks who were dabbling and hacking into computer code – not we’ve got the Bio-Punks hacking into biological code. Any comments on the longevity sciences side of this? Like the quest for immortality. Google’s big in that, and there’s a lot of stuff about that. In the two books prior to this one, there was one that dealt specifically with that, about the search for immortality. Time Magazine had an article just recently that said that 2040 will be the year man becomes immortal, and that’s probably realistic. Immortal forever? Or living to 150 or 200, or what? Basically just doubling our life span. Incredible. It’s just amazing. We’re on the verge of so many amazing things, let’s hope we don’t mess it up with something really ugly and bad, as you certainly point out. There are some downsides to this, and it’s amazing and scary at the same time. James, give out your website and tell the listeners where they can find you. It’s www.jamesrollins.com to find out more about the books. For any writers out there, there’s a whole section on my website with tips from a writer’s life. I’m also very active on Facebook, which I think gives that intimacy between the readers and the authors, which I didn’t have 15 years ago when I started. You can get right to them, and they can talk right with you. That’s fantastic. Well James Rollins, thanks so much for joining us today. What’s great about the shows you’ll find on www.jasonhartman.com is that if you want to learn how to finance your next big real estate deal, there’s a show for that. If you want to learn more about food storage and the best way to keep those onions from smelling up everything else, there’s a show for that. If you honestly want to know more about business ethics, there’s a show for that. And if you just want to get away from it all and need to know something about world travel, there’s even a show for that. Yup, there’s a show for just about anything. Only at www.jasonhartman.com, or type in ‘Jason Hartman’ in the iTunes store.